I met Michael on our college campus and we ended up spending that whole day together and nearly every day since! Nine years later, Michael and I went on vacation to Australia. We spent our last day there on the beach in a town called Byron Bay, hometown to one our favorite rock bands. As I was soaking up the sun, Michael wrote “Will You Marry Me?” in the sand. When I sat up to find his proposal, of course I said yes! No other venue in town compares to Above. 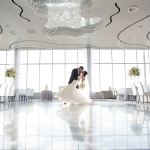 As the general manager of the Hilton Garden Inn New York/Staten Island, I see weddings almost every weekend and am always blown away by Above’s unique, elegant ambiance and the wonderful service the staff provides. Richard and Lois Nicotra, the owners, are such caring people and ensure every couple gets the best experience possible. Sue Vaiana, senior event planner, and the whole staff were so knowledgeable and helpful every step of the way. Jeff Boris, the banquet manager, and the banquet staff executed everything seamlessly and perfectly. Matt Mulik, the executive banquet chef, and the culinary team provided the most delicious and unique food. For our ceremony, we created an aisle in the ballroom that our bridal party walked down, followed by me and my father. Our officiant, Julie Laudicina, personalized our ceremony by telling our special love story and our guests are still raving about how unique it was. As we walked back down the aisle, now as Mr. and Mrs. Martin, our guests waved fiber optic wands! Michael and I love video games and comic books, and Above surprised us with an ice sculpture of the Marvel comic book character “Deadpool” at our rooftop cocktail hour! The food included an antipasto station; a harvest station with various fruits, vegetables, cheeses, and flatbreads; and specialty pizzas served right from the rooftop’s pizza oven. Butlers also passed hors d’oeuvres. Our favorites were the herb-crusted lamb chops, lobster fritters with Thai chili aioli, and calamari stuffed with shrimp and crab. Our ballroom décor was inspired by a blue orchid flower I had saved for our wedding. Our gorgeous candle wall was lit in blue, giving the room a romantic feel. The tables were draped with silver table cloths and adorned with alternating high and low centerpieces filled with blue orchids and white roses. To start our first dance, our names were spotlighted on the dance floor. Dinner started with a salad with parmesan dressing and a pappardelle short rib ragu dish. For the main course, guests chose grilled filet mignon in bernaise sauce, chicken en croute stuffed with prosciutto and mozzarella in sun-dried tomato sauce, or pan-seared sable with pea risotto. For dessert, butlers passed mini desserts and guests could choose either a piece of red velvet cake or a chocolate/vanilla cake. We had all kinds of fun entertainment at our reception. We had a photo booth, a TV with a Nintendo setup, and our amazing DJ, who had everyone on the dance floor all night, playing a little of everything to cater to all the age groups present. He also displayed a special photo montage of me and Michael over our decade together. Our photographer/cinematographer created and played a first-edit cut of our footage from before the reception. We were amazed how quickly they put the video together! Thank you to the Nicotra’s, Sue, Jeff, Matt, and the whole Above staff for providing such a wonderful experience from start to finish. Thank you to all our vendors for their talent in making our day so uniquely us. Thank you to both our parents for their support and for making this day possible. Finally, thank you to all our friends and family, who made our wedding day so special for us.